So, as I posted earlier, I went to Berlin for the weekend with some mates. We picked Berlin as it sounded like it had a good mix of culture and nightlife. Since I had the time, I got saddled with booking flights and hotels. I picked a reasonably cheap hotel near the center of Berlin called the BB Hotel and booked it through www.bookings.org. There wasn't much availability as a big consumer electronics tradeshow was in town. Unfortunately, it turned out to be a very gay hotel in a very gay part of Berlin. I have nothing against homosexuality but given a choice, I don't want to be surrounded by guys dressed in leather and big boots. My friends were horrified and I'm never gonna hear the end of it. Anway, I'm very impressed with Berlin. It's a very liveable city. I mean, I would consider living there. Transport was cheap and efficient. For 19 euro's each we had unlimited subway travel for three days including the trip to and from the airport. There's no one center to Berlin but there's lots of happening area's with their own things going on. There first afternoon there, it rained so we went to the consumer electronics show. Hey, we're guys and it was a big toy show! The place was absolutely massive but there's only so many flat LCD screen's you can look at. Afterwards, we wandered down Skalitzer Straffe in the Kreuzberg looking for dinner and bars. Not a very good choice really. The second day, we joined a Third Reich walking tour starting at the Brandenburg Gate. The guide was an American Ph.D. student who was studying the Third Reich. He was excellent. He showed us the plans for Welthauptstadt Germania and where it would have been built and told us lots of other stories. If you have any interest in WWII or the Cold War, Berlin is fascinating. We ended the tour at the site of Hitler's Bunker. There's nothing left and it's only recently that the location of the site has been acknowledged. 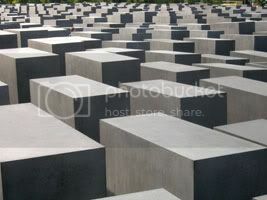 Nearby is the poignant Holocaust Memorial. I wish we had had time to do some of the other walks. That evening, we wandered around Potsdamer Platz where no man's land is being rebuilt into a metropolis and then went off to the Hackescher Markt where there's some very lively bars and restaurants. 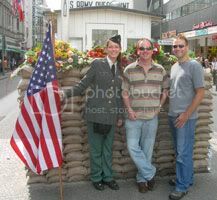 The third day, we checked out of the hotel and had lunch on Unter den Linden - the famous street of old Berlin. We then squeezed in a bit more touring. First stop was the Jewish Museum. The building is shaped like a shattered Star of David and was designed by American architect Daniel Libeskind. It was worth the visit for better understanding Jewish culture and the long sad history of persecutions. Walking North we discovered the Gendarmenmarkt by accident. It's one of the grandest squares in Berlin. Not far away, we made it to Checkpoint Charlie and a museum there that chronicles the many attempts, some successful, some not, at getting across the wall. It was getting late by then so we went back to the hotel, grabbed our bags and headed to the airport. There's plenty more in Berlin that we didn't see and I'd certainly be happy to go back a few more times. If you go, track down a copy of free guide called "Sandeman's New Berlin" which is a very handy English guide to the city.